Claiming to be the first film to use real cadavers (not that much of a publicity ploy), this is hardly a plus point, as this more than likely consists of just a few in the background of this medical school horror flick. A female corpse with a tormented soul reaches into the land of the living when her cadaver is used as one of the practice bodies used by a group of medical students in one of their courses. Soon some people start to disappear and turn up brutally murdered, the bodycount increasing. While it is grissly entertainment (like gross scenes of someone having to climb into a formaldehyde tank filled with corpses), and some scary dark hallway moments, narrative-wise it feels underdeveloped and the lagging pace ads to it being a bit drawn out. 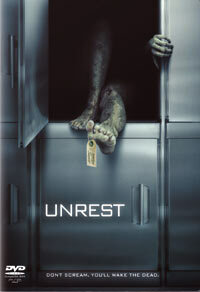 But with the performances mostly convincing, and the naturally uncomfortable subject of corpses an instant squirmer, Unrest will certainly find viewers to freak out.